It was back to winning ways for Badminton’s Prodigal Son as Taufik Hidayat was crowned the “Nizam” of the India Open 2009 at Hyderabad today. Taufik last topped a podium at the last Grand Prix Gold event in Macau. Pi Hongyan, on the other hand, scooped her first title in nearly three years while youngsters Ma Jin and Wang Xiaoli took their first title since their junior days. By Gaurav Gupta, Badzine Correspondent live in Hyderabad. Photos: Gaurav Gupta (live) and Badmintonphoto.com (archives)There could be no better treat for the fans gathered at the Gachi Bowli stadium than to witness Hidayat’s win against Md Hafiz Hashim of Malaysia in the men’s singles final. There were flashes of his brilliance today but first gear was all that Taufik needed to capture his first title of 2009. The 21-18, 21-19 score line would suggest a close game but the Indonesian master never allowed Hafiz any whiff of a possibility. The Malaysian was unable to build on a 14-7 lead in the first game. A playing style that saw him matching Taufik at the net was not sufficient to compensate for his inability to come up with answers against Taufik’s brilliant outright winners. A quick exchange of points at the start of the second left Taufik trailing 2-4 but that was all the impetus Taufik needed. 10-11 was the point score at the towel-down and both players traded some delightful strokes as Hafiz displayed when he came up with a backhand smash of a similar quality of Taufik’s much to the delight of the small Malaysian fan gathering, but it was clearly evident that Taufik was the player in charge. Stringing together a series of 4 points he leapt to a 19-17 lead from which Hafiz could never recover. “I’m surprised by the support I got in this tournament and thank you to all the fans. I had a great time at the tournament,” commented Taufik, thereby winning himself a very special place among the Hyderabadis. Pi Hongyan’s brilliance in making the requisite tactical changes at the right moment was critical in quelling the challenge of a spirited Julia Wong as she claimed her first major title win since the 2006 Singapore Open. The Chinese-born French girl had to overcome frustration as she was unable to come to grips with the drift and kept serving long and hitting her lifts way past the baseline in an error-ridden first game. Taking advantage of an unsettled Pi, the Malaysian girl opened a 3-point margin from 15 all to 18-15 eventually winning the game 21-17. Realizing that her rally style of play was not best suited to the court conditions, Pi made the critical shift in tactics and steamrolled to an 8-5 lead crafting 5 points in a row only to be chased back by Julia as they went into the mid game break with Pi trailing 10-11. Keeping the shuttle down and attacking into Julia’s body was the masterstroke the French star employed as she strung together another series of 5 straight points to claw back to a 16-12 lead and close the game 21-15 to level the match. The setback of the second game did not seem to weigh heavily on Julia as she built a 7-4 advantage early in the third game. But it was Pi who had made the quick change necessary to adapt to the drift. Another series of 5 points for Pi saw her take control as she went up 13-9 and there was no looking back from then on. By the time Pi put together another 4 points in a row to go up 19-12, Julia had no chance of coming back. Pi claimed her Indian Open crown winning the third game 21-14. “I realized there was a problem and told myself – it is you who has to find a solution,” Pi said later. That solution was the key to the title treasure chest for a very delighted Pi as she carried her signature happy smile all the way to the podium to collect her prize cheque. The veteran duo of Choong Tan Fook / Lee Wan Wah quickly wiped away the disappointment of the Malaysian losses in the men’s and women’s singles finals in their “demolition derby” against the hapless Singaporean pair of Hendri Saputra / Hendra Wijaya. It seemed like the Malaysians were hell-bent on breaking their record of the fastest finish to the first game (they had taken only 4 minutes in their 1st semi-final game against Wijaya/Riyadi) and were just prevented from doing so as Saputra/Wijaya stretched them to 6 minutes before Choong/Lee won 21-9. Serve, Return and Attacking Smash Winner – was the formula used by the experienced Malaysians as they continued their destructive ways into the second half of the match. It was only a matter of time before the relentless attack of the wily veterans saw a meek surrender by the Singaporeans, who never looked like they’d got into the match. 17 minutes was all the time the former Asian Badminton champs needed to claim a title that seemed rightfully theirs from the outset, as they won the second game 21-11. Hyderabad saw three repeat finalists from the last Grand Prix Gold event. In addition to Taufik and Julia, unseeded combination of Ma Jin / Wang Xiaoli came to the court looking for a golden title. The 2006 World Junior Champions took their first ever senior title, bringing the Chinese their only gold medal from this Indian outing. Faster court coverage and clean hitting from Wang Xiaoli gave the Chinese duo the upper hand right from the start. Taking advantage of a jittery Vita Marissa, the Chinese duo directed their attack towards the more experienced of the Indonesian pair whose error-prone game was exploited. Strings of points at key times characterized the entire match with Ma/Wang winning 5 on the trot in each game. The 21-14, 21-13 win ended in just under the half-hour mark and was testimony to the clinical finishing which has trademarked the Chinese performance throughout this tournament week. 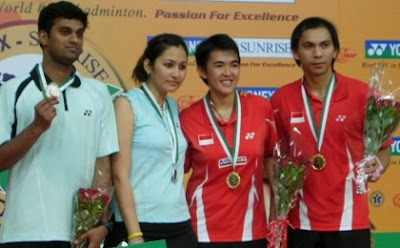 The experienced pairing of Flandy Limpele and Vita Marissa made it a second Indonesian gold on finals day, capturing the mixed doubles title at their first tournament together since Beijing. Putting pressure on Jwala Gutta’s heavy court movements and with the Indians forgetting that the weak link was Marissa and not Flandy, the Indonesians outplayed the home pair in the first game 21-14. Limpele/Marissa were put under pressure by the Indians in the second. The boisterous gathering helped the home pair to surge to a 17-13 lead. But “the drift”, a major factor influencing matches in the venue, sent two drive returns from Diju sailing out. That was the only opening that the Indonesians needed to conjure up eight straight points and claim the XD title finishing off the match 21-17 in the second. In the morning session on day 1 of the Swiss Open Anthony Clark and Donna Kellogg sent out a stark reminder to the rest of the English squad that they mean business in Basel this week. The world number 4 pair took just 23 minutes to send their English understudies Adcock and White home with their tails between their legs. The English number ones might feel they have something to prove this week in Switzerland after what must been seen as a poor week for English badminton at the All England’s last week in Birmingham. In what was being billed as a ‘Battle of Britain’ in today first round turned out to be nothing more than ‘walk in the park’ for the experienced duo as they powered home to a 21-7 21-5 win. In the first set the English Veterans cruised to a virtually unchallenged victory and the second set was more or a warm down that a competitive game as, after the game was tied at 4-4, the younger English duo only managed one further point in the entire game. World number 1 pairing Nova Widianto and Liliyana Natsir continued to struggle on European soil this spring as they took three sets to see of the Challenge of David Lindley and Suzanne Rayappan. The Indonesians will be hoping to bounce back this week after their early defeat in Birmingham last week. Limpele and Russkikh had to bow out in the first round after their heroics in reaching the semi final of the All England’s last week. A disappointing 21-17 21-13 defeat to Malaysia’s Tazari and Wong will leave the new global pairing with much to ponder ahead of their summer’s Super Series trip to Asia. Elsewhere in the mixed doubles first round Olympic champions got off to a shaky first set start with a 22-20 win over German duo Overzier and Schoettler. The Beijing gold medallists composed themselves and pull away in the second for a 21-8 win and a second round berth. There was delight for the home Swiss crowd as Agung and Tuwankotta left their higher ranked French opponents reeling with a three set win. The Swiss took the opener but Careme and Choinet hit back with a tight 27-25 win after the Swiss squandered match point at 25-24. The Swiss duo held their nerve in the final set and after falling behind 11-5 bounced back to stun their French opponents to take the set 21-18. Blair and Bankier blew a 13-11 lead in the final set of their first round match and their challenge appeared to instantly dissolve as their Chinese Taipei opponents won the next 10 points to dump the number 6 seeds out at first round stage. Lin Dan today claimed his fourth All England in impressive fashion as he reaffirmed his position as the greatest men’s singles player on the planet in beating world number 1 Lee Chong Wei in a repeat of the 2008 Beijing Olympic final. The crowd went wild as both Lin Dan and Lee Chong Wei entered the stadium this afternoon in Birmingham, England. There was not a vacant seat in the house as all assembled were transfixed as they eagerly awaited the repeat of the Olympic final from Beijing last August. The boisterous fans were not to be disappointed as both players dished out a master class in professional badminton in what was a perfect advertisement for the sport in general. The first set was a very competitive affair as it was clear from the off that both players were up for the challenge. Early on it was the Chinese Olympic Champion that set the pace as he eased into a 8-2 lead aided by amazing net play and pin point smashing. Lee Chong Wei fought back to the delight of the vast hoards of Malaysian fans in the arena and at the mid game interval only trailed by 2 points. Both players continued to amaze the crowd with rallies of exquisite badminton but it was Lin Dan who had the upper hand and at 16-12 looked to have the set in the bag. Lee Chong Wei then hit the Olympic Champion with a counter punch and won 3 points to close to within 1 and after Lin Dan stopped the rot with a smash down the line, Lee Chong Wei once again pressed the accelerator to win 4 unanswered points to take the lead in the first set for the first time 19-17. As if not to be outdone, it was now Lin Dan’s time to counter and from a seemingly hopeless position he went to win four straight points to clinch the opener 21-19 to the rapturous applause of the appreciative Birmingham crowd. It was clear to all assembled that winning here was vitally important to Lin Dan as he clinched his fist after winning the opening set. “In the first set there were a few occasions where I let him (Lee Chong Wei) back into the set but I stayed calm and worked to my plan. It was a close game and it could have gone either way but I managed to stay focused and win,” commented Lin Dan on his opening set win. In the second set, the Malaysian started off in positive form, and with a little help from a few unforced net errors by Lin Dan, eked out a slender 6-5 lead. Lin Dan then won the next four points to take a 9-6 advantage and had Lee Chong Wei hanging onto his coat tails at 14-12 where the destiny of the match still hung in the balance. It was at this point that the Olympic Champion proved to everyone assembled why he is the best in the world and went on a point-winning spree to take 7 points in a row to claim yet another All England title. As the match point shuttle dropped aimlessly over the end line, from a Lee Chong Wei lift, the Chinese star clenched his fists with joy and saluted the packed arena. “I think we both played very well today and really the winner today was the game of badminton. I think we gave the spectators what they wanted and Lee Chong Wei was as much a part of that as I was. I have won everything there is to win in badminton now but I still have motivation to be the best ambassador for the sport I can. Without doubt this is a huge motivation for me,” said Lin Dan after his historic win. In the first match on court the Chinese number 3 seeds He Hanbin and Yu Yang stumbled in losing the opening set to brand-new Korean pair Ko Sung Hyun and Ha Jung Eun. 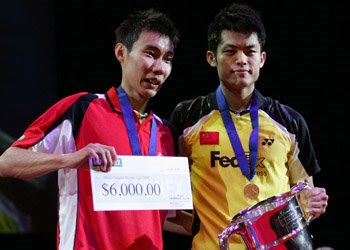 The Chinese pair hit back in the second to level the match at one set each and in the third just cruised away from the Koreans to take the 3rd 21-9 and with it the title of All England Champions 2009. “The first game we were not good today but we corrected our approach for the second and managed to get ourselves back into the match at 1 set each. In the third we played very well and played to our strengths and we are obviously delighted to win the All England title. This is a great boast in confidence for us as we are only a new pair and we look forward now to going on and improving more and winning many more tournaments,” said He Hanbin after the Chinese mixed doubles win. China claimed its third title on finals day as number 7 seeds Zhang Yawen and Zhao Tingting beat compatriots Cheng/Zhao in two sets 21-13, 21-15. YONEX ALL ENGLAND – Zhou Mi out but hardly an upset!! World number 2 and number 2 seed Zhou Mi had to succumb to the talents of Chinese shuttler and recent German Open winner Wang Yihan in what, on paper, appears an upset but in reality is just another day at the office for the Chinese wonder kid. In day of a few surprises in the women’s singles it was Wang Yihan’s turn to dump a seed out of the tournament. The Chinese shuttler dented Zhou Mi’s aspirations of All England glory in the longest game of the day which extended to 6 minutes over an hour in a titanic three set battle. Wang Yihan took the opening set after both players struggled to find any consistent rhythm as they shared the lead back and forth to level at 19-19. Just when it looked like the set might extend beyond 21 the world number 17 found the inspiration to take the next two points to deal the first blow in this badminton marathon. In the second set the momentum once again ebbed back and forth but this time at 18-18 it was Zhou Mi who found the touch to take the three points she needed to level that match up at one set a piece. In the third the world number 2 took a seemingly unassailable lead at 13-5 and looked to be heading to the quarter final but Yihan found the resolve and determination to fight back and level the match at 18-18 and even went on to lead at 19-18. Both players were level again at 21-21 and with match point to Yihan at 22-21 Zhou Mi drove into the net to give the Chinese shuttler the win and in doing so put the 4th Chinese shuttler into tomorrow’s quarter final. In the mixed doubles it was a bad day for Denmark as all three of their remaining pairs were shown the door at the second round stage. Earlier in the day the combinations of Bonde/Neilsen and Delbo Larsen/Schjoett Kristensen fell at the hands of Asian opponents and late in to the evenings play world number 5 pair of Thomas Laybourn and Kamilla Rytter Juhl were beaten in three sets 16-21 21-12 21-18 by Chinese pair Zheng Bo and Ma Jin. Cai and Fu continued to impress on their return as a pair with a 25 minute win in 2 sets over Korean pair Kwon and Yoo while number 2 seeds from Denmark Rasmussen and Passke were clearly refreshed after been rested for the European Team Championships two weeks ago as they took only half an hour to defeat Ikeda and Sakamoto from Japan. As the evening drew to a close Denmark’s men’s and women’s singles players continued to fly the flag for the European powerhouse as Peter Gade and Tine Rasmussen followed Persson and Brosolat Jensen in making it through to tomorrows quarter final. Boe and Mogensen continued that winning trend for Denmark with a convincing win over Fuchs and Kindervarter from Germany 21-18 21-11. In the battle of Britain in the mixed doubles it was a case of experience emerging victorious over youth. Number 4 seeds Anthony Clark and Donna Kellogg in their first appearance at this years All England’s were composed is ending the dream of Gabby White and Chris Adcock 21-14 21-16. 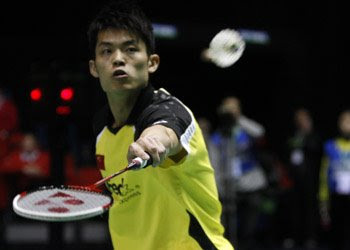 The most anticipated match of the day in Birmingham saw the return to action of Olympic Champion, Lin Dan, who entered the arena to rapturous applause. The charismatic world number 2 is a clear crowd favourite here in Birmingham and to all a clear favourite for the men’s singles title, which to some commentators he handed on a plate to his compatriot Chen Jin this time last year to help his fellow countryman’s efforts for Olympic qualification. Lin Dan took to court today and in typical Lin Dan fashion gave his fans plenty of highs and lows as he moved effortlessly into tomorrow's second round with a 2 set win over world number 50 Anup Sridhar from India. The Indian shuttler took the very first point of set one but that was to be the only time he headed ‘Super Dan’ in the opening set. As if to tease his opponent the Olympic Champion always seemed to dangle the temptation of an upset by keeping a safe but catchable distance ahead of his opponent but eventually took the opener 21-13 to leave Sridhar the almost impossible task of needing to take the next two sets to advance. The second set was altogether much closer as for the majority of the game and both players had the crowd on the edge of their seats as they traded blows and points and were all square at 14-14. Lin Dan at this point seemed to push the overdrive button as if to show the crowd that he was always in control and instantly won the remaining 7 points needed to take the set and the win and doing so sets up the tie of the second round against recent German Open winner Bao Chunlai of China. Defending women’s champion Tine Rasmussen entered the tournament with a potentially tricky tie against Xing Aiying of Singapore. Rasmussen is attempting to retain her title that she claimed last year which is a feat that has not been achieved by a Danish women’s singles player since Lene Koppen achieved back to back wins in 1979 and 1980. Rasmussen, sporting her new Babolat attire, was made fight hard against her world number 29 opponent. Aiying took a commanding lead in the first and at 17-14 up looked to be on the way to causing an upset. Rasmussen re grouped and was clearly not in the mood for a three sett battle this early in the tournament and took the next 7 points to take the opening set 21-17. In the second set the world number one was never led as she controlled the set with power and craft. Aiying was still in the game at 10-9 but then Rasmussen took firm control and compiled two runs of 3 points without reply and eventually ran out a comfortable winner 21-15 in a match that lasted just under a half hour on court number 2. Other winners in the late evening session were number 5 mixed doubles pair from Denmark Laybourn and Rytter Juhl as they overcame Korean pair Han Sang Hoon and Kim Min Jung in two tough sets 21-17, 21-19. In the final match of the day, English hopes were dealt a further blow as Sarah Bok was forced to withdraw from the mixed doubles due to illness having played earlier in the day in the women’s doubles. This was a blow for the young English pair as they had come through qualification to reach the first round and must have fancied their chances to cause a further upset and make a second round appearance, but it was just not to be. Anastasia Russkikh (Russia) and Flandy Limpele (Indonesia) caused a ripple in the Chinese sea today as they beat Xie Zhongbo and Zhang Yawen in three sets. The Chinese were obviously strong favourites for the match but the experience of Russkikh and Limpele paid dividends and today’s result, in combination with their semi-final appearance in Germany last week, has gone a long way to establish the pair as a major force in international mixed doubles badminton. Limpele and Russkikh who were brought together by GPS (www.globalplayerservices.net) at a meeting at the French Open in 2008, were today victorious over established Chinese pair Xie Zhongbo / Zhang Yawen Not many expected the European/Indonesian pair to win but they have come together this season with a goal and purpose to display to the world that they have what it takes to take on the top pairings in mixed doubles badminton. The first set ebbed and flowed back and forth as both pairings found their All England feet. It was Russkikh/Limpele who eked out a mid-game lead at 11-7 but the Chinese bounced right back to take the next 5 points to level the game at 11-11. The score board continued to fluctuate in increments of one as both teams played struggled to find the kinks in their opponents' armour. The Chinese had a slender lead at 17-16 and once they had their nose in front they did not need another invitation as they rattled off the next four points to take the opening game 21-16. In the second set, the first six points where traded before Limpele and Russkikh applied the gas and put some daylight between themselves and their opponents at 9-6. The Chinese sensed the game was slipping away and rallied to close the gap and level at 9-9. At this point, with Russkikh playing with renewed vigour at the net, the Russian/Indonesian combination slowly but surely started to pull away and at 18-12 had the set in their hands. Xie and Zhang pressurised their opponents at this point and clawed their way back into the set to get within 2 points of Russkikh/Limpele but the experience of Limpele was crucial as he steadied the ship to eventually take the set 21-18. The final set went very much the way of Limpele/Russkikh as the Chinese had no real reply to the power of Russkikh at the net. Once Russkikh/Limpele got their noses in front they seized the opportunity and the Chinese had no plan B and ultimately no answer of consequence to bring to the table. Russkikh and Limpele wrapped up the set 21-17 after blowing three match points to book their second round ticket where they will meet the winners of the battle of Britain between Bankier/Blair and Lindley and Rayappan. “Today we just went out to enjoy ourselves as we have only had one week's practise ahead of this tournament. We did well last week at the German Open so we knew we had a good game coming into this tournament but we still have a lot of improving to do. It will be at least a year before you see the best of us as it takes that long to get used to a new partner,” said Limpele after his first round win. Elsewhere in the mixed doubles, Denmark can be happy this evening as both Nielsen/Bonde and Schjoett Kristensen/Delbo Larsen advanced to the second round. Nathan Robertson was forced to retire earlier to day due to a bout of the flu, which means English number 1 pairing of Clark and Kellogg advance without having to make an appearance, much to the chagrin of the large home crowd that obviously turned up to see the ‘All England’ match at the All England. YONEX ALL ENGLAND Day 2 – Brosolat dashes Scottish Hopes. As the first round proper kicked off this morning in Birmingham it was Nanna Brosolat Jensen (WR 46)who had most reason to celebrate after beating Susan Hughes 99 (WR 27) from Scotland. The Dane showed no signs of a qualification hangover as she beat Hughes in three sets in one of the early matches on court. Meanwhile Marc Zwiebler, smarting a heavily bandaged thumb, showed that injury is no deterrent as he sent Boosak Ponsana home in three sets. Nanna Brosolat Jensentransferred her qualification form into main draw heroics as she came back from a set down to beat Susan Hughes in today’s morning session at The All England’s. 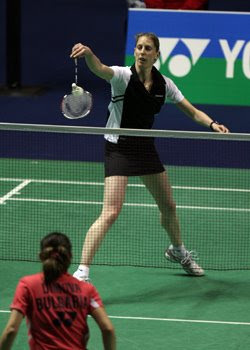 Brosolat Jensen, who was a part of the Danish team who won the recent European team Championships, started slowly as she lost the opening set as Hughes dominated. Hughes was never headed in that opening salvo to take a one set lead 21-13. Words of wisdom, after the first set, from Danish coach Lars Uhre obviously spurred Brosolat Jensen to lift her game as she took to the court for the second set. The game was finely balanced at 13-12 to the Dane but a run of 6 points without reply saw Brosolat Jensen storm into a commanding 19-21 lead and she maintained her composure to take the set 21-16. The third set, and to coin a cliché, was literally a game of two halves. Hughes took the early initiative with some precise but aggressive play and headed her opponent 10-16. At this point the game turned on its head as Brosolat Jensen appeared to find an extra level and go on a run of 7 points without reply to leave Hughes shell-shocked. Brosolat Jensen managed to maintain her advantage, and although Hughes never gave in, the Dane managed to maintain her composure to take the set 21-17 and with it her place in tomorrow’s second round. Meanwhile Marc Zwieblerentered the tournament with little expectations after being forced to pull out of his home Grand Prix last week with an injured thumb. The first set was a cautious affair and it was not until Ponsana (WR 12) went on a 7 point winning streak when leading 13-12 that the game opened up. Ponsana finished off the job efficiently to take the opening set 21-14. In the second set both players once again exchanged blows early on in an effort to seize on any available weakness in their opponent. Ponsana appeared to be heading to victory when he opened out an 11-8 lead but Zwiebler immediately pounced back to win the next 7 points and before Ponsana had time to recover the German applied more pressure to take the set 21-15. In the third set it was the German’s turn to take the upper hand in the early exchanges and worked his way tirelessly to a 15-10 lead. Ponsana, seeing his chance slipping away, regrouped to level the game at 15-15 and as bot (pjhoth players exchanged consecutive points. At this point it was anyone’s match as the large first round crowd watched intensively. Ponsana looked to have the match wrapped up at 21-19 but Zwiebler went on to win the next three points to take the match and set 22-20. “After injuring my thumb I came her not expecting much so there was little or no pressure on me. In the first game I didn’t play well at all due to lack of practise but I sensed that he (Ponsana) was not playing that particularly well either. I had to adjust my game and be more patient which is hard for me as I’m a more of an attacking player and this worked as it helped me win that second set. In the third I still played a patient game and took my opportunities when they came my way. I am obviously delighted with this win as I really didn’t expect it. Tomorrow I will more than likely play Lee Choong Wei and once again I will go into that game with no pressure.” Said a delighted Zwiebler after his victory. Elsewhere, in the morning session, two of the title favourites in the men’s singles had to take 3 sets to book their second round spots. Both Taufiq Hidayat and Chen Jin went to deciding rubbers in their first round games against Yu Hsin Hsieh and Kenichi Tago respectively. Part timer Jill Pittard of England was beaten in her first round singles match and there was delight when Jenny Wallwork and Gabby White finally put some smiles on the faces of the home crowds as they beat Malaysian pair Goh Liu Ying and Ng Hui Lin 22-20 in the deciding rubber. The much anticipated greatest badminton show on earth kicked off this morning in Birmingham, England as the majority of the worlds best shuttlers descended on England’s second city with just one thing on their minds, to be crowned the All England Champion and in doing so write their name into the badminton history books. England got off to the worst possible start as they lost both their fancied men’s singles qualification hopefuls in Rajiv Ouseph and Carl Baxter but Jill Pittard gave the home crowd something to cheer about as she came through women’s singles qualification to join Elizabeth Cann in the main draw tomorrow. Recently crowned English national champion, Rajiv Ouseph was the first major casualty on qualification day at the All England’s as he went down in three sets to Ireland’s Scott Evans. Evans, spurred on by a vocal Irish contingent in the crowd, played some very controlled and mature badminton to beat Ouseph in what was revenge for his defeat in the Irish International Final back in December 2008. 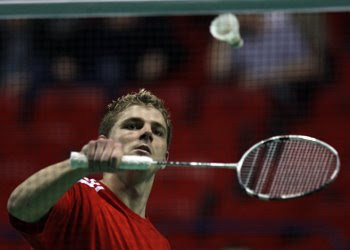 Evans was unable to build on that win as he subsequently fell at the hands of India’s Anand Pawar in three sets. Pawar advances to the main draw where he will face off against Sony Dwi Kuncora of Indonesia tomorrow. India had double reason to celebrate when Anup Sridhar completed the difficult task of beating two Malaysians to secure his first round ticket. France’s Brice Leverdez (photo) also had reason to joyful on his maiden trip to the All England’s. The French number one encounter traffic in the shape of Kestitus Navickas as the promising Lithuanian took the opening set to 18 but Leverdez fought back to take the match with a 21-17 21-17 in the second and third. In the bottom half of qualification, China’s Gong Weijie overcame stiff opposition to claim a first round spot in a day that saw 10 of the 12 men’s singles matches go to three sets. In the women’s singles four different nationalities qualified for tomorrow’s main draw with Europe claiming 3 of the four spots. Linda Zechiri of Bulgaria will take her spot as qualifier number 1 after two tough three set battles against England’s Nicola Cerfontyne and Hsiao Huan Chen of Taipai. The relief for the Bulgarian was audible as she screamed with joy on taking match point on court number four. Nanna Brosolat Jensen of Denmark was rarely forced to shift out of second gear in qualification section number four as she swiftly ended the hopes of American Lauren Todt and English hope Rachel Howard both in straight sets. Jensen will now face Scotland’s Susan Hughes in tomorrow’s first round proper. Jill Pittard (photo) was one of only a few rays of light on qualification day for England as the Land Rover engineer claimed her first round berth in easy fashion sending Anu Nieminen and Diana Dimova on early flights home. The fourth qualifier from the women’s singles was Korean shuttler Soo Young Jang. After beating Shao Chieh Cheng in the first round her qualification efforts were halved as fellow Korean Youn Joo Bae was forced to retire so was unable to take her place in the final of section three of qualification. In the men’s doubles there was further disappointment for the home nation as none of the English pairs managed to light up the arena. It was China’a day in this discipline as the combinations of He Hanbin/Sun Junjie and Guo Zhendong/Xu Chen were effortless in their relentless march to the main draw. Joining them in tomorrow’s draw will be Japanese duo of Hayakawa/Kazuno after they beat Malaysian pair Abdul Latif/Chan in three sets 19-21 23-21 21-17. The final match on qualifying day witnessed Danish success as Mikkel Delbo Larsen and Rasmus Bonde dealt another blow to British hopes as they sent Andrew Bowman and Martyn Lewis packing in three. Andrew Ellis and Sarah Bok (main article photo) finally gave the English fans something to get vocal about as, after being promoted from the reserves, they fought bravely to take a deserved place in the first round proper of the mixed doubles tomorrow. The combination of Overzier/Schoettler were intent on making life hard for themselves as they lost the first set to 8 against Maz Agathangelou and Robin Midleton. In typical German style they fought back and managed to close out the game in three as they took the second and third sets 22-20 24-22 in a match that had the majority of the crowd transfixed and sometimes bemused. The women’s doubles qualification saw all 4 remaining pairs promoted to the main draw which means for the first time in recent super series history there will be a full complement of 32 pairs taking to the courts in the first round which is sure to please the organisers. Cast your mind back to the China open where this particular competition had pairs get free rides right through to the quarter finals. KUALA LUMPUR: One of the early men’s doubles favourites Koo Kien Keat-Tan Boon Heong cannot afford to take forty winks in the All-England even in the absence of two key pairs. A number of scratch combinations and rising young pairs will be lurking dangerously to scalp them in Birmingham. On Monday, the organisers confirmed the withdrawal of the Olympic and world champions Markis Kido-Hendra Setiawan of Indonesia due to the former’s knee injury. The Indonesian top seeds have been replaced by qualifiers Kasper Faust Henriksen-Christian John Skovgaard in the main draw. The men’s doubles event had also lost some of its glitter earlier when South Koreans Lee Yong-dae-Jung Jae-sung announced that they will not defend the title because of the latter’s obligation to serve under the country’s military programme. In their absence, 2007 champions Kien Keat-Boon Heong and 2005 winners Cai Yun-Fu Haifeng of China will start as favourites. Denmark will have two strong pairs — second seeds Lars Paaske-Jonas Rasmussen and Mathias Boe-Carsten Morgensen — in the pack to challenge for the title. The others expected to give a good account of themselves are Malaysia’s Mohd Fairuzizuan Mohd Tazari-Mohd Zakry Abdul Latif and England’s Anthony Clark-Nathan Robertson. But one cannot underestimate the scratch partnerships of Yong-dae-Shin Baek-cheol and Indonesians Candra Wijaya-Joko Riyadi. Yong-dae-Baek-cheol in winning the German Open last Sunday showed that they have the ability to spike the early favourites. Candra-Joko are playing in their first international tournament and Indonesia can count on the experience of the former to make the pair strong challengers. In the Malaysian Open in January, Candra teamed up with Luluk Hadiyanto for the first time and they reached the quarter-finals. Kien Keat-Boon Heong are expected to meet Candra-Joko in the second round. Indonesia will also be banking on two younger pairs — Mohd Ahsan-Bona Septano and Yonathan Suryatama Dasuki-Rian Sukmawan — to ruffle some feathers. The Koreans, in a bid to add more depth to the men’s doubles, have in the competition three other upcoming pairs — Han Sang-hoon-Hwang Ji-man, Cho Gun-woo-Ko Sung-hyun and Kwon Yi-goo-Yoo Yeon-seong.